Freelance photographer Suzanne Paris has been on her own since she was fourteen—and she has no intention of settling down, especially not in a tiny town like Walton. She’s here to hide out for a little while, not to form connections. Her survival depends on her ability to slip in and out of people’s lives, on never staying in one place for too long. 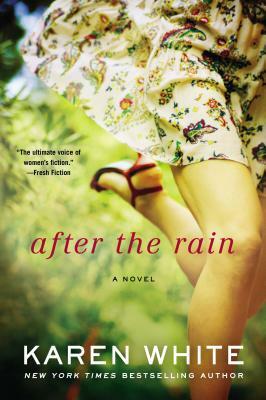 After the Rain is a sequel to the author’s earlier work Falling Home. If you’ve read Falling Home, do you remember these characters and how have they changed? Is it a pleasurable experience to reunite with them? Did you have any suspicions about Suzanne’s true identity? How does the author create such a vivid sense of place? How would you describe Walton? Do you recognize your own hometown in this special corner of the world? The women of Walton keep the community strong, and literally are the caretakers of memories (as with Maddie’s scrapbook). In what other ways are women the soul of the town? How have Harriet’s children dealt with the loss of their mother? How have the adults? Does Suzanne do the right thing by prolonging her exit from Walton, even as it begins to put Joe’s career in jeopardy? What prevents Suzanne and Joe from moving forward in a romantic relationship? How does Harriet’s presence still inhabit the day-to-day lives of her family and home? Why do you think Maddie chooses to confide in Suzanne, a stranger to town, over her own family, and especially Cassie? How is Suzanne safe or more objective? How does she help in the situation? Had you heard of “pennies from Heaven” before? Do you think such a phenomena is real? Or have you experienced it? Do you think Harriet would have (or does) give her blessing to Joe to move on? Would you want your loved one to find love again after you pass on? Could you have destroyed the negative? What do you think you would have done in this situation? How does Suzanne attempt to make up the loss to Maddie? Do you think Cassie’s objections, and guarded behavior, to Suzanne was justified? Is Joe’s personal life and affairs really her business? Does Cassie see a little of herself in Suzanne? “She remembered cradling Maddie that night on her porch, and the tight feeling in her chest she’d experienced while watching Harry sleep in his crib. And even the need to make the hurt go away when Sarah Frances has been sick with chicken pox.” Do you find this description accurately paints “maternal feelings”? Would you add any others? Do you think Suzanne is ready to assume a maternal role? Where do you see the main characters of this book in five years? In thirty?